When are dead people not ghosts? That's easy. When they try to eat you! Haunted Flesh: Stories of the Living Dead collects six of Australian horror maestro Robert Hood's creepiest, most outlandish tales of flesh-bound cadaver mayhem. 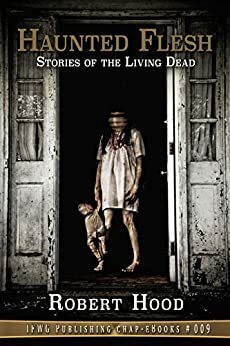 Some tear bloodily into the tradition established by director George A. Romero with his Living Dead series of films, while others paddle in a murky pool of science-based resurrection, alien possession, undead whimsy and voodoo politics. Important questions are addressed: Does the essence of life lie in the mind or in the heart? Do the dead make good workers? When a creepy evangelist knocks on your door, what does he mean when he offers you the secret of eternal life? Should you invite zombies to a BBQ? Is the Prime Minister really dead? The answers may shock you, they may make you laugh uneasily, but either way you'll never look at life and death the same way again. As a special bonus, this volume includes an important article that exposes the truth behind the zombie movie tradition! "... laugh-out-loud funny, and boasts levels of gore that would make George Romero blanch. This may well be the very best zombie tale I’ve ever read." (Horrorscope review of "In the Service of the Flesh").